Dr. Nonogaki has worked as a Postdoc Research Fellow at the University of California, San Francisco and the Scripps Research Institute, La Jolla. He has studied central serotonin network in the regulation of appetite and energy homeostasis. Lorcaserin (Belviq), a selective 5-HT2C receptor agonist, which is used for the treatment of obesity, is based on the original research works by Dr. Nonogaki et al. Current studies are to determine the physiological mechanisms and potential treatment for obesity, type 2 diabetes and their complications. 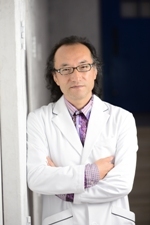 Dr. Nonogaki is also developing novel medical devices for hypertension and diabetes.